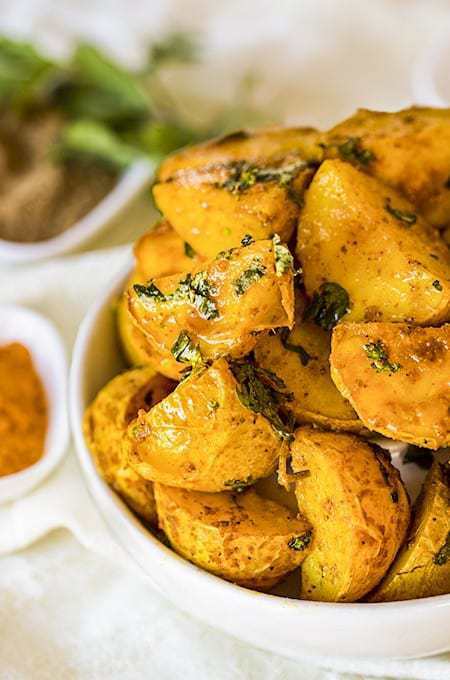 These Vegan Amchoor Potatoes recipe will rock your world with their combination of tart and spice. I grew up eating these tart and spicy potatoes–along with lots of oil. 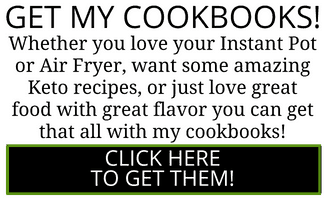 Use your Air Fryer to make these perfectly crispy, with very little oil, and in no time at all. My mom used to make this dish and I absolutely LOVED it as a kid. 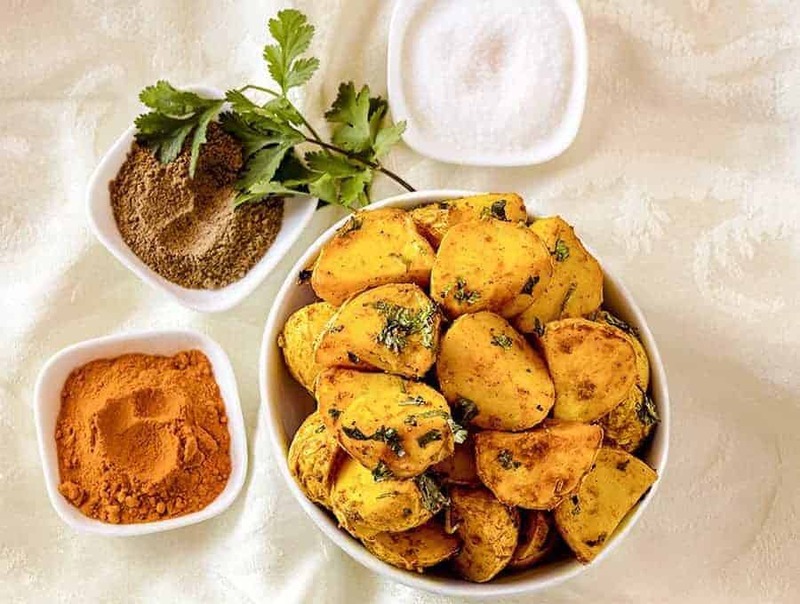 These amchoor potatoes or amchoor aloo, along with a chappati and some masala chai is all anyone needs to be happy–especially when you’re six years old and your biggest worry is what game to play at recess tomorrow. I’ve made these once or twice as an adult but I had two problems. One, by the time the outsides got crispy, the insides were still raw. By the time the insides were cooked, the outsides were burnt. I know I could have parboiled the potatoes, but I’m #lazyefficient. 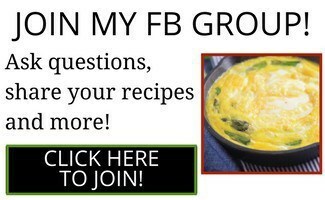 So I hate two step recipes. The second issue was the oil–oh my goodness the oil you need to get these made right! Either you will use a lot of oil, or your potatoes will stick. The third issue was the level of babysitting demanded by these. Worse than a naughty two-year-old. Air frying takes care of all of these issues so bring on the amchoor potatoes! Amchoor is a dried mango powder, and it’s definitely worth buying it for this recipe. It’s tart and tangy and sour and just wonderful. Sometimes you will find it’s also spelled as aamchur. These Amchoor potatoes are a staple dish in Indian Punjabi cooking. But the traditional way requires so much oil to ensure that the potatoes don’t stick! Air frying these potatoes is a great way to get tart and spicy potatoes that are slightly crisp on the outside and creamy on the inside. You can also substitute chaat masala for the Amchoor for a change of pace, or try it with sumac instead. If you like Punjabi style potatoes, you should definitely make my recipe for Aloo Gobi Potatoes and Cauliflower! 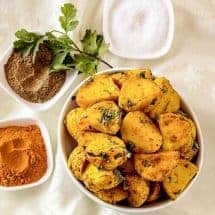 These Vegan Amchoor Potatoes recipe will rock your world with their combination of tart and spice. I grew up eating these tart and spicy potatoes--along with lots of oil. 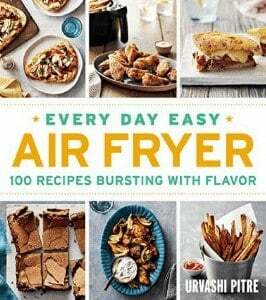 Use your Air Fryer to make these perfectly crispy, with very little oil, and in no time at all. In a large bowl, add potatoes, oil, turmeric, amchoor, salt, cumin coriander blend, and cayenne pepper. Mix well. Place the seasoned potatoes in the air fryer basket and cook at 400F for 15 minutes. 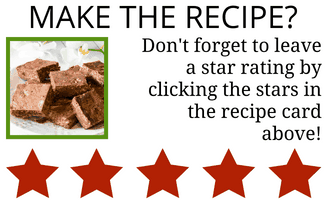 Check to ensure the potatoes are cooked through. Sprinkle lemon juice and chopped cilantro onto the potatoes and serve.